EV Lacertae is is located only about 16.5 light-years away in the northeast part (22:46:49.7+44:20:2.4, ICRS 2000.0) of Constellation Lacerta, the Lizard -- southeast of Alpha Lacertae; east of the North American Nebula, M39, and Deneb (Alpha Cygni); west of Lambda Andromedae; and northwest of Omicron Andromedae. 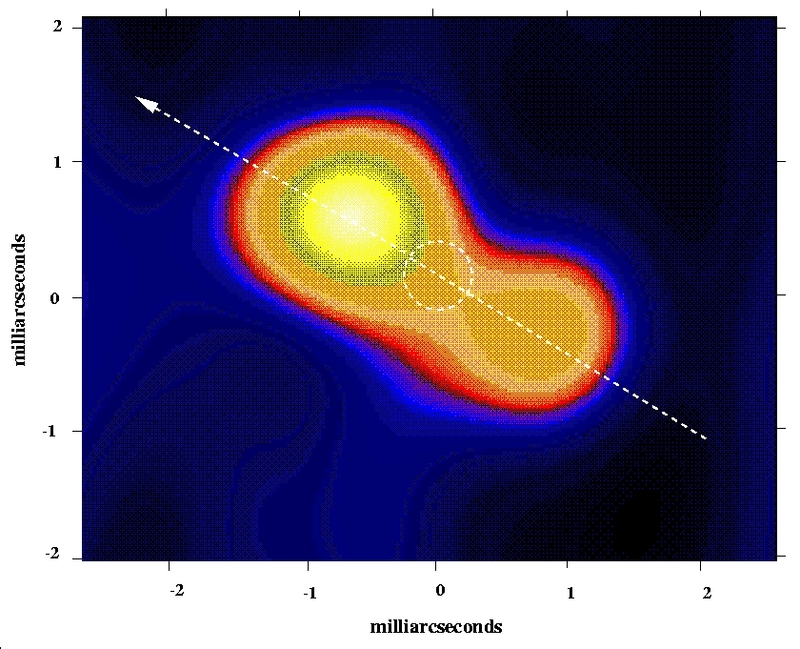 The star has an optical companion with a separation of five arcseconds. Although EV Lacerate is a well-known flare star that has been extensively observed by telescope, this red dwarf star is usually too faint to be seen with the naked eye. On April 25, 2008, NASA’s spaceborne Swift X-Ray Telescope detected the star flaring so brightly that it became briefly visible in Earth's night sky to unaided Human eyes (NASA news release). Some astronomers may also refer to this star by its designation as the 873rd star system (Gl 873 or GJ 873) in the famous Gliese Catalogue of Nearby Stars (CNS, now ARICNS database) of Wilhelm Gliese (1915-93), who was a longtime astronomer at the Astronomiches Rechen-Institut at Heidelberg (even when it was at Berlin). The star, however, was probably first observed and designated as BD+43 4305 in a catalogue that was originally published in 1863 by Friedrich Wilhelm August Argelander (1799-1875) on the position and brightness of 324,198 stars between +90° and -2° declination that were measured over 11 years from Bonn, Germany with his assistants Eduard Schönfeld (1828-1891) and Aldalbert Krüger (1832-1896). The catalogue became famous as the Bonner Durchmusterung ("Bonn Survey") and is typically abbreviated as BD. It was later expanded and extended during the early 20th Century with the Cordoba (observed from Argentina) then the Cape Photographic Durchmusterung (observed from South Africa). This cool and dim, main sequence red dwarf (M3.5 Ve) may have about 29 percent of Sol's mass (RECONS estimate), 38 percent of its diameter (Johnson and Wright, 1983, page 703), and less than 17/10,000th of its visual luminosity and 1.2 percent of its bolometric luminosity (NASA Star and Exoplanet Database, derived from the exponential formula of Kenneth R. Lang, 1980). 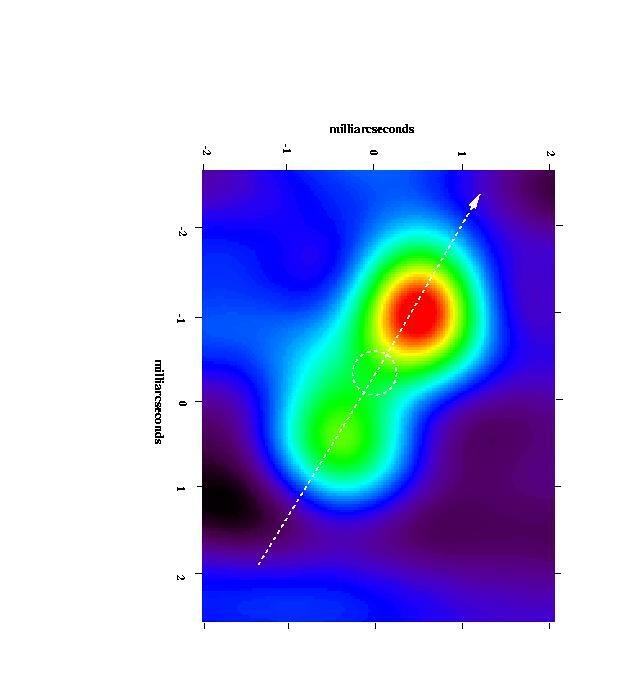 Only be a few hundred million years old, EV Lacertae has been observed to have starspots (or active areas) and may be long persisting at least one polar region (Pettersen et al, 1992; A. David Andrews, 1983; and Bjorn Ragnvald Pettersen, 1980), and at least one "superflare" prior to 2008 was observed (Rojzman and Shevchenko, 1982). 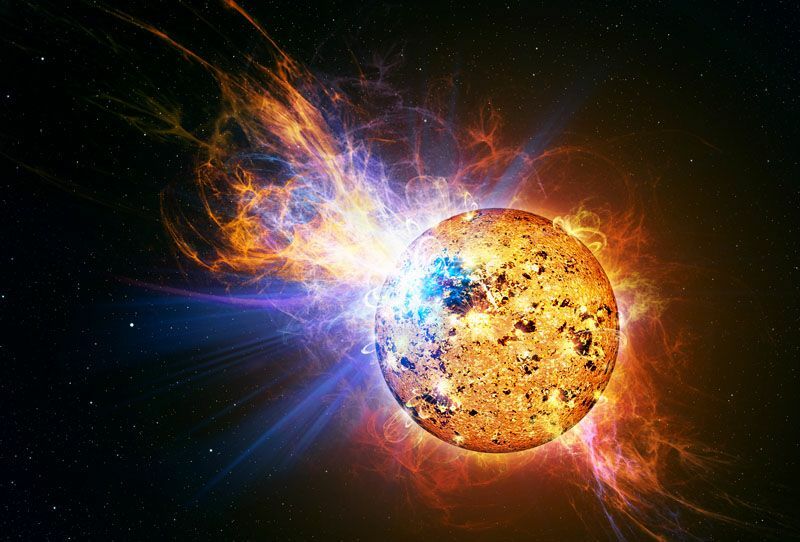 The young, eruptive variable star completes a rotation in less than 4.4 days (unlike Sol's 25.4 days or over three and a half weeks) which creates a magnetic field around a hundred times stronger than the Sun's (NASA news release; and Michael E. Contadakis, 1995). Past observations suggest that EV Lacertae could have an unseen companion (more below). A UV-Ceti type flare star, EV Lacertae has been given the variable designation EV Lacertae. Some useful star catalogue numbers and designations are: EV Lac, Gl 873, Hip 112460, BD+43 4305, G 216-16, LHS 3853, LTT 16695, LFT 1737, and Vys/MCC 852. According to one type of model calculations performed for the NASA Star and Exoplanet Database, the inner edge of EV Lac's habitable zone is located relatively far from the star at around 0.112 AU from the star, while the outer edge lies even farther out at around 0.218 AU. The distance from EV Lac where an Earth-type planet would have liquid water on its surface is centered around 0.165 AU -- well within the orbital distance of Mercury's orbital distance in the Solar System. At that distance from the star and with 0.29 Solar-mass, such a planet would have an orbital period exceeding 45 day (or 0.124 Earth years). If there is life on any Earth-type planet orbiting youthful EV Lac, it is likely to be primitive single-cell, anaerobic (non-oxygen producing) bacteria under constant bombardment by meteorites and comets as Earth was for the first billion years and massive stellar flares. a flaring UV-Ceti (Benz et al, 1998). flaring like the dimmer companion of Luyten 726-8. In the 1970s and 1980s, some astronomers suggested that observed flare activity or light minima in EV Lac's light curve between flares could have been caused by an eclipsing companion with an orbital period of around 45 years and a high orbital eccentricity (e~0.5) (G. Sh. Rojzman, 1984; and Sarah L. Lippincott, 1983; and Bernard W. Bopp, 1974). One earlier study also suggested a long-period astrometric companion with between 0.01 and 0.03 Solar-mass (van der Kamp and Worth, 1972). Many dim, red (M) dwarf stars exhibit unusually violent flare activity for their size and brightness. These flare stars are actually common because red dwarfs make up more than half of all stars in our galaxy. Although flares do occur on our Sun every so often, the amount of energy released in a solar flare is small compared to the total amount of energy that Sol produces. However, a flare the size of a solar flare occurring on a red dwarf star (UV Ceti) that is more than ten thousand times dimmer than our Sun would emit about as much or more light as the red dwarf does normally. Flare stars erupt sporadically, with successive flares spaced anywhere from an hour to a few days apart. A flare only takes a few minutes to reach peak brightness, and more than one flare can occur at a time. Moreover, in addition to bursts of light and radio waves, flares on dim red dwarfs may emit up to 10,000 times as many X-rays as a comparably-sized solar flare on our own Sun, and so flares would be lethal to Earth-type life on planets near the flare star. Hence, Earth-type life around flare stars may be unlikely because their planets must be located very close to dim red dwarfs to be warmed sufficiently by star light to have liquid water (about 0.0075 AU for UV Ceti), which makes flares even more dangerous around such stars. In any case, the light emitted by red dwarfs may be too red in color for Earth-type plant life to perform photosynthesis efficiently. The following star systems are located within 10 ly of EV Lacertae. Up-to-date technical summaries on this star can be found at: the Astronomiches Rechen-Institut at Heidelberg's ARICNS, the NASA Star and Exoplanet Database, and the Research Consortium on Nearby Stars (RECONS) list of the 100 Nearest Star Systems. Additional information may be available at Roger Wilcox's Internet Stellar Database. Constellation Lacerta is one of seven (including Canes Venatici, Cetus, Leo Minor, Lynx, Scutum, Sextans, and Vulpecula) introduced by Johannes Hevelius (1611-1687) in his catalogue of 1564 stars (Prodromus Cometicus) published in 1665 after his death by his wife. For more information on stars and other objects in Constellation Lacerta, go to Christine Kronberg's Lacerta. For an illustration, see David Haworth's Lacerta.